The “Virus Found” is just one of the many pages of the so-called misleading advertising type. It is made to force you into downloading an questionable software. If your Mozilla Firefox, Safari and Chrome itself redirects to the “Virus Found” web page then this might be a sign that you’ve an unwanted software from the ‘ad-supported’ software (also known as adware) family installed on your Apple Mac. The adware is designed in order to display third-party advertisements to the user without asking his permission. The adware takes control of installed internet browsers and redirects them to various unwanted sites like the “Virus Found” every time you surf the Net. is infected with (3) Viruses. The pre-scan found traces of (2) malware and (1) phishing/spyware. System damage: 28.1% - IMMEDIATE REMOVAL REQUIRED! A website you've visited today has infected your Mac with a virus. It is necessary to scan your entire system to find and remove malicious applications from your computer. The adware which cause misleading “Virus Found” fake alerts to appear, may insert tons of advertisements directly to the web sites that you visit, creating a sense that the ads have been added by the developers of the web-page. Moreover, a legal advertising links may be replaced on the fake ads, that will offer to download and install various unnecessary and harmful programs. Even worse, the ad-supported software can be used to gather lots of your confidential info (your ip address, what is a page you are viewing now, what you are looking for on the Internet, which links you are clicking), which can later transfer to third parties. So, obviously, you need to remove the adware ASAP. Use the free instructions below. This guide will help you clean your Apple Mac of adware and thus delete the “Virus Found” intrusive pop up advertisements. 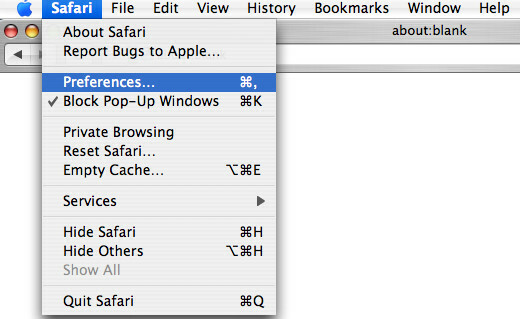 The following steps will allow you to remove “Virus Found” pop up warnings from the Safari, Chrome and Firefox. Moreover, the few simple steps below will allow you to get rid of malicious software, hijackers, PUPs and toolbars that your computer may be infected. Please do the tutorial step by step. If you need help or have any questions, then ask for our assistance or type a comment below. Read it once, after doing so, please print this page as you may need to exit your web-browser or reboot your MAC. The useful removal instructions for the “Virus Found” pop-up. The detailed procedure can be followed by anyone as it really does take you step-by-step. If you follow this process to remove “Virus Found” pop-up let us know how you managed by sending us your comments please. First, go to the Finder and delete questionable software, all applications you do not remember installing. It’s important to pay the most attention to software you installed just before “Virus Found” pop up warnings appeared on your web browser. If you don’t know what a program does, look for the answer on the Internet. 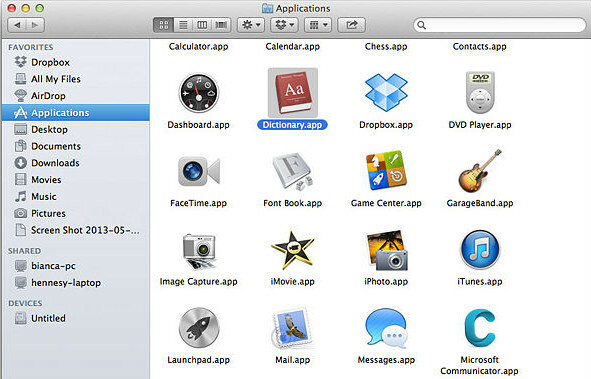 Open Finder and click “Applications” as shown in the following example. You will see a list of apps installed on your computer. We recommend to pay maximum attention to the application you installed last. Most probably, it’s the adware that displays misleading “Virus Found” popup on your Apple Mac. If you’re in doubt, you can always check the program by doing a search for her name in Google, Yahoo or Bing. Once the program which you need to remove is found, simply right click on its name, and choose “Move to Trash”. The Safari reset is great if your web browser is hijacked or you have unwanted addo-ons or toolbars on your web-browser, which installed by an malware. The FF reset will keep your personal information such as bookmarks, passwords, web form auto-fill data, recover preferences and security settings, get rid of redirects to annoying “Virus Found” web-site and ad-supported software. Launch the FF and press the menu button (it looks like three stacked lines) at the top right of the web browser screen. Next, press the question-mark icon at the bottom of the drop-down menu. It will open the slide-out menu. Click the “Refresh Firefox” button at the top right of the Troubleshooting Information page. Select “Refresh Firefox” in the confirmation prompt. The Firefox will begin a task to fix your problems that caused by the ad-supported software that causes multiple misleading “Virus Found” alerts and pop ups. After, it’s complete, press the “Finish” button. Like other modern web browsers, the Chrome has the ability to reset the settings to their default values and thereby recover the browser’s settings such as home page, search engine by default and new tab page that have been modified by the adware that causes browsers to open misleading “Virus Found” fake alerts. You need to confirm your action, press the “Reset” button. The browser will start the procedure of cleaning. Once it is finished, the browser’s settings including default search provider, new tab page and homepage back to the values that have been when the Google Chrome was first installed on your MAC system. If your machine is still infected with ad-supported software that causes multiple misleading “Virus Found” alerts and popups, then the best solution of detection and removal is to use an anti-malware scan on the machine. Download free malicious software removal tools below and run a full system scan. It will allow you remove all components of the adware from hardisk and Windows registry. Delete “Virus Found” popup warnings manually is difficult and often the ad supported software is not completely removed. Therefore, we suggest you to use the MalwareBytes that are completely clean your machine. Moreover, the free application will help you to remove malicious software, PUPs, toolbars and browser hijackers that your computer can be infected too. Visit the page linked below to download the latest version of MalwareBytes AntiMalware (MBAM) for Mac. After the download is finished, please close all applications and open windows on your MAC. Run the downloaded file. Follow the prompts. The MalwareBytes will open and display the main window. Further, click the “Scan” button . 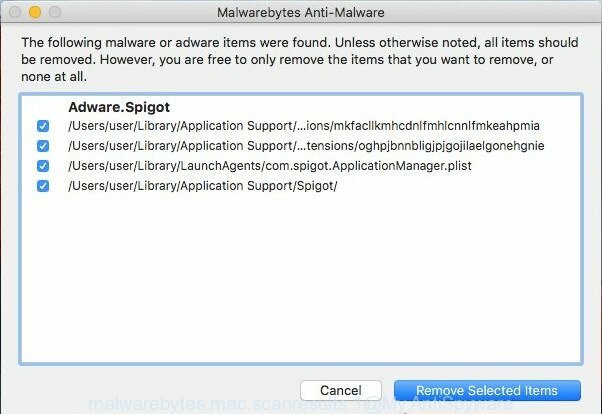 MalwareBytes Free tool will start scanning the whole MAC OS to find out adware which designed to display misleading “Virus Found” popup warnings within your browser. This task can take quite a while, so please be patient. When a threat is detected, the number of the security threats will change accordingly. Wait until the the scanning is finished. After that process is complete, MalwareBytes AntiMalware will display a list of all items found by the scan. The AdGuard is a very good adblocker program for the Google Chrome, Safari and Firefox, with active user support. It does a great job by removing certain types of annoying ads, popunders, pop ups, undesired new tabs, and even full page ads and web-page overlay layers. Of course, the AdGuard can block the “Virus Found” pop up automatically or by using a custom filter rule. Installing the AdGuard is simple. First you’ll need to download AdGuard by clicking on the following link. Save it on your Microsoft Windows desktop. When the setup is done, press “Skip” to close the installation program and use the default settings, or click “Get Started” to see an quick tutorial which will help you get to know AdGuard better. In most cases, the default settings are enough and you do not need to change anything. Each time, when you launch your computer, AdGuard will launch automatically and stop pop-up advertisements, “Virus Found” redirect, as well as other malicious or misleading sites. Usually, adware gets into your MAC as part of a bundle with freeware, sharing files and other unsafe software that you downloaded from the World Wide Web. The creators of this adware pays software authors for distributing ‘ad supported’ software within their programs. So, optional applications is often included as part of the installer. In order to avoid the installation of any adware which shows misleading “Virus Found” pop-up warnings on your Apple Mac: select only Manual, Custom or Advanced installation method and uncheck all optional programs in which you are unsure. Once you’ve finished the guidance shown above, your MAC should be clean from this ‘ad supported’ software and other malware. The Google Chrome, Safari and Mozilla Firefox will no longer open annoying “Virus Found” web-page when you browse the Internet. Unfortunately, if the steps does not help you, then you have caught a new adware, and then the best way – ask for help. Please start a new thread by using the “New Topic” button in the Spyware Removal forum. When posting your HJT log, try to give us some details about your problems, so we can try to help you more accurately. Wait for one of our trained “Security Team” or Site Administrator to provide you with knowledgeable assistance tailored to your problem with the intrusive “Virus Found” pop-up warnings.